Jason Hartman welcomes Dr. Jane Orient to the Holistic Survival show. Jane is an author of the book entitled, “Your Doctor Is Not In” and is an Executive Director for the Association of American Physicians and Surgeons. Jason and Jane sit down to talk about radiation concerns, how to protect yourself, brief thoughts on Ebola, and much more on this week’s episode. 1:25 – Jason introduces Jane. 3:40 – Ebola lives in the animals in Africa, so it can not be totally wiped out. 5:30 – What about the radiation concerns in the sea? Jane breaks it down. 8:10 – Is there something we can regularly eat to prevent radiation poisoning? 10:50 – Jane suggests purchasing a Sirad card to measure radiation levels. 13:40 – Are we in World War 3 now? 16:00 – What about the threats of global warming? Jane shares her thoughts on this. 20:10 – Final thoughts from Jane about fear and real threats we’re facing today. 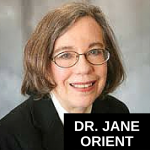 It’s my pleasure to welcome Dr. Jane Orient to the show. She is Executive Director of the Association of American Physicians and Surgeons. President of Doctors for Disasters Preparedness, managing editor of the Journal of American Physicians and Surgeons and editor of Civil Defense Perspectives, author of Your Doctor Is Not In:Healthy Skepticism About National Health Care and author of the new book, The Truth About Ebola: Protect Yourself and Your Family. Doing fine, how about you? Fine, thank you, and give our listeners a sense of geography by telling us where you’re located. Wow, not far from me, I’m in Phoenix. Good, good stuff. Well, maybe first talk about Ebola, what a scary threat that is. Have we seen the worst of that scare in the US or should we be prepared for something more? Well, it appear to have died down at the present time in the US. It is by means over in Africa, which mean is it’s still going on somewhere in the world. We could have imported cases. Public health is still screaming at people who travel near by air from the countries that are affected and they may be kept under surveillance for about 21 days. So, does that mean they’ll be quarantined, actually? No, they’re generally not quarantined. They ave different categories of risk. Most of them are not at very high risk, so they check in by telephone. If they are not having symptoms and they weren’t really exposed to patients who were ill, then that’s probably all that’s needed, but someone of them do have face to face surveillance if they feel that it’s a higher risk and the hospitals are all prepared and wearing person-protect gear and phone numbers of people to call, so that they have a patient with suspicious exposure, they can be taken to a facility that’s better equip to handle them. Sure, sure. How are we doing on the possibility of a cure, a vaccine, where are we on that? Well, there’s some vaccines that are being tested, but who knows how long that will take and I’m not sure that one wants to be the first one to take the vaccine. It would seem that the first order of business is to contain the disease. What’s the status of it in Africa? I mean, you said by no means over and, you know, certainly it’s not as much in the news as it was for a while there. I mean, what’s going to happen? What’s the prognosis for Africa? Well, regular reports are not being sent out any longer, but it lives in the animals there. There is an animal reservoir, so it can’t really be totally wiped out, but it’s hope that it will go away and at least get down to a level where you maybe an isolated case in there, but it’s not being widely transmitted. It may reemerge at some other point and carried by bats and other animals in the wild, many of which are hunted for food by people and then there’s the danger of the burial practice there that heavily expose families to decreased loved ones who are infected. Before we move on to some other things that I want to cover, what else would you like people to know about the Ebola threat? Just anything that I haven’t asked. I think that we need to be a little more concerned about importing disease from abroad. It used to be that visitors or at least people planning to stay here for a period of time had a much more intensive screening that they have now, right now it’s much more difficult to get an animal into the country, then it is to get a human being even though that human being may be caring some diseases that we’re not even familiar with here. Dengue and Chikungunya are special threats and we are seeing those. They’ve even been cases in Florida that were transmitted locally and were just not from travels. Travelers from Hati are particular at risk for Chikungunya. In terms of your broader work, you know, in terms of disaster preparedness and so forth, what’s going on with Fukushima? You know, I hear somewhat sporadically now about radiation levels in the sea and the fish, debris and so forth washing up on the west coast. How big of a concern is that and other nuclear power issues? So far no body has died from Fukushima. No one has been exposed or even gotten sick to significant dose of radiation. Yes, there is measurable radiation in the water, but there’s radiation everywhere. You can safely eat the fish. I think that a steak from one of the fish that’s been concerned is kind of like eating 1/20th of a banana if you look at the actual concentration of CC meds in there. I think there’s been a huge amount of hype about this. People are terrified of radiation. A lot of the stories will say, well, double the usual dose, but it doesn’t tell you want the dose really is. It could be 10,000 types of background dose and still probably be insignificant. What you really need to know quantitatively what the dose is. Just out of curiosity and I don’t know if this is your area at all, but you made me curious about it when you were talking about these different doses; microwave ovens. You know, I use mine fairly frequently, should I be concerned about that? Well, I’m not. It’s not ionizing radiation. Most microwave ovens, I mean, they have a shield on and you can get a device that will measure whether any of the microwave radiation is leaking out from it. Some people say it affects the food. I don’t know of any evidence for that, so I can just say, I use it without fear and I’m not aware of good evidence that you need to be afraid. Is there any type of supplementation, something someone should make sure they have in their diet to thwart radiation? There are stock piles of iodine, potassium iodine, that you used to be kept and maybe still are for Civil Defense emergencies, because one of the isotopes from radiation accident from a nuclear bomb could attack your thyroid gland and render you hypo-thyroid, so if you take potassium iodine ahead of time, then that will block your thyroid so the radioactive iodine is not taken up and it’s just excreted. So, I have some and some people do, but it’s not something that people should be panicking about. And that’s something that you would take in an actual incident. You know, I remember I used to live in New Port Beach, California and people close to the San Onofre nuclear plant were given that, you know, down in San Clemente in the south part of Orange county, but you know, that’s like for emergencies. I’m just wondering if there’s a dietary thing that can offset, you know, TSA, microwave ovens, x-rays at the doctor, you know, whatever. Things like that, I just thought I’d throw the question out there. I don’t know of any. I think the height about low-dose radiation is really dangerous, because it gets people fearful of having diagnostic tests that they really need or medical treatments that are very beneficial and it is also based on this linear no-threshold theory that any tiny dose of radiation is harmful and this is probably just not true. It’s the dose that determines the danger. You can overdose on salt, water, vitamins, just about anything, but the evidence that we have from people and the course of their occupation say flying across on a flight crew or working in the nuclear industry or in the early days of the nuclear industry when standards were much less vigorous or accidental exposures like in some apartments in Taiwan that were built with contaminated rebar that, in fact, the lowest certain dose, this radiation is probably protected. Like in Taiwan, people’s cancer rate was 90% below the normal expected in the surrounding areas, so I think that by just making people afraid of radiation, which by the way is the easiest thing in the world to measure with an instrument, they’re depriving themselves of some very great benefits. Not just nuclear energy, but medical applications. Oh right, yeah, no, I definitely agree. I mean, fear mongering can definitely hurt in so many ways. Your point is well taken and duly noted there. So, let’s talk about terrorism and that threat. Should the government be doing something that they’re not doing, should we have shelters, you know, what concerns are going on in that side of the Civil Defense side. Well, nothing. Our Civil Defense program was almost completely dismantled in the 1990s, the radiation meters were maintained for many years for junks. I got the Arizona supply and other private people got some of the other supplies, but the rest I think were just dumped in a landfill and they were not replaced with anything. So, if they were a serious incident like a nuclear detonation like some of those nuclear weapons that are proliferating all over the world, we are largely unprepared to measure what the threat is. What should we be doing about that? Do we have to take matters into our hands? I mean, should everybody own a Geiger counter? I think people should seriously look into having some instruments. There are now things called Sirad that have a chemical compound that changes color permanent when exposed to radiation. You can get those for about $30. We’ve been trying to distribute things like this to first responders, fire fighters and police, so that they can inform people that the risk is nothing to panic about and they should go to work or if there is something of a risk, they should shelter in place, but people should not be going nuts over fear of radiation when it cane be easily measured and very often it’ll be shown to be a level that’s not going to make them sick. Yes, they did make stickers. Stickers were available, one time, I think some of those are still available, but they also have things that look like a credit card that have a little scale on them and a sensor that changes color under exposure. My change color a little bit just going through airport x-rays frequently. And TSA, whenever you complain about that they tell you it’s not radiation, well, what is it? I mean, you’re some how seeing through my clothing. Well, I think from those scanners, it really is insignificant. My card goes through on the conveyer belt and, yeah, there is certainly a higher dose of radiation that they use on your bag. I love to see a study on TSA employees who are near that equipment all day long. It’s just always on, you know, an 8 hour shift, 5 days a week, you know, someone should do a study on that if their cancer rates are higher or if there are any other effects. There are a lot of studies and workers, not TSA workers, whose exposures very, very small, but in once it had significant exposures like aircrews and their cancer rates are not higher than normal. Because when you’re up further in the atmosphere, you know, 40,000 ft, is that what you’re talking about? The pilots and the flight crew? Yes, you get significant doses of radiation in flight crews. So, it’s not. That study is really is okay, huh? I think so, but you know, if these people wanted to wear radiation monitors, they could, they could buy a Sirad card for themselves. I have tried to contact TSA and told them about this technology. I am not worried about the equipment they’re using, but I am worried about nuclear terrorism and these people should be protected and they aren’t. Well, let’s talk about that, I mean, with all this stuff that’s going on in the world, you know, it might be a fair question to ask if we’re actually in World War 3 now. You know? It’s pretty scary what’s going on out there. I guess, I’ll ask that question of you and then talk about the nuclear terrorism threat. Well, I think that’s a very good question and some people say maybe we are in World War 3, but when did World War 2 start? It didn’t start with Pearl Harbor, it was going on in Europe long before then. Are these a little episodes of terrorism that we have in the United States? Are they part of World War 3? Could we have another event much worse than 9/11 happening simultaneously in many cities? I think we could and if we did, we don’t even have the instruments and we certainly don’t have people with educated to have the understanding. School kids in the 1950s knew a whole lot more about radiation than college graduates do today. So, what’s the main threat, do you think? Is it a dirty bomb, is it a Russian nuke that gets loose? I mean, Russian is falling apart again it seems. Well, obviously a nuclear weapon is much more dangerous than a dirty bomb. The dirty bomb would mainly kill people from the blast, from the explosive, and it would have huge economic effect just from..and territorial effect even though the radiation dose that would be experienced would probably not kill anybody. It’s probably the blast that would kill people, but they might shut down the whole city, because of our highly over, over sensitive radio detection equipment and just the panic that people has been driven to their heads that there’s no faint dose of radiation. Anything we can do as individuals about that other than meters, which you talked about. You should inform yourself and we do have a couple of websites, PhysiciansForCivilDefense.org and DDPOnline.org – that’s for Doctors for Diaster Preparedness and we have had an annual meeting and most of our video tapes are up on the web. Our bi-monthly newsletters I’ve been doing for about 20 years are all available and they frequently covered what their threats are, what the threats are not, and what you can do to inform and to protect yourself and your family. Very good resources by the way. Thank you for that. So, talk to us about some of the other threats if you would. We hear about global warming constantly, you know, all of these different issues, you know, I mean, there’s just so much out there. What do you think so of the bigger threats are? Well, I think the biggest threat is the overreaction to this global warming thing. We have had the same goals for decades and that is to shut down and ration global energy production and it started with the fear that we’re going to run out of oil and then in the 1970s there was the fear that we’re going to have an ice age and now there’s this global warming, which by the way has been undetectable for the past 20 years and we are now about the mean global temperature of the 3,000 year average. It’s kind of true the globe has gone up and down. We’ve had ice ages, we’ve had medieval warm period, the roman warm period, when the weather was a whole lot better than it is now, and because of this threat, which now people are attributing to emissions of carbon dioxide, they’re trying to shut down 40% of our electrical generating capacity from coal and that would be a real disaster. So, why would it be a disaster? Speak for that for a moment. What do you mean, economically or? Well, this country is so dependent on electricity for safety, for food storage, for heating and cooling our homes; for transportation, for hospitals, for law enforcement, for all of our industry. If we lost 40% of our electrical generating capacity, it would be a terrible economic catastrophe as well as just a regular health catastrophe, because people would not have the power that they need to live. No question about it. So, I just find it funny that people actually think the Tesla, for example, is an environmentally friendly card. I mean, 40 to, some estimates say up to 60%, I guess it depends where you live and where you gain your power of the power is generated from coal. I mean, the Tesla is a coal-burning car, largely, and then you mine the coal, you gotta take it out of the ground, you gotta transport it, I mean, it’s, I don’t know, to me, I think nuclear is just the cleanest thing we’ve got so far. It is the cleanest thing we’ve got, but coal is cheaper, it’s readily available, it is essential for developing countries if they don’t want to stay myriad and poverty and misery, they’re going to have to use these available resources, but nuclear, yeah, nuclear is the safest form of large scale energy generation that exists. So, why is there so much disagreement over the whole, you know, I love how the global warming people re-branded it themselves and called it climate change, because you can’t always prove warming. Why is there so much disagreement about this? I mean, I’ve had people on the show on both side. I even had a reporter with the New Yorker on the show who actually hung up on me, because I was asking her questions. I mean, she was so convinced and so adamant, you know, if you don’t believe in global warming, you’re an idiot! I mean, sure literally said that. You couldn’t ask her a question. It was like, I mean, are we having a religious debate here? Yes, I really think we are and if you are an academic and your department gets any type of federal grants no matter what they’re for, your whole department could be shut down by losing its grant money. If anybody there whispers any skepticism about the global warming thing and yet there was a petition fund by 31,000 American scientists who say there’s no scientific evidence that this is a major threat and in fact carbon dioxide in the atmosphere stimulates plant growth, that’s absolutely no doubt about that and there are many people in the world who are eating a whole lot better, because there’s a little bit more Co2 in our atmosphere. Interestingly, I mean, the ultimate end-game of that movement has to be to reduce the population, because that’s what people exhale and people are the evil, right? I think that a lot of them will explicitly say that we’ve got to reduce the population of the globe. Who get’s to decided who stays and who goes I wonder. Well, it’s not going to be you and me, that’s for sure. Very interesting, very interesting. Very disconcerting actually. Okay, well, is there anything else Jane that I didn’t that you want to throw out there and make people aware of? Well, I think we’re living in a very dangerous time and I think a lot of the things that people are fearful of and on the account of which our economy is being crippled by draconian regulations are not things to be worried about, but there are many threats that we do need to worry about, for example war and the proliferation of nuclear weapons and wide spread terrorism and our total lack of preparedness. Again, any action steps you want to leave people with? You gave out the websites, it’s a great resource, thank you for that. Any other action steps? I think inform yourself and try to be able to stay in your house for a couple of weeks without going out whether it’s epidemic or a civil line arrest or the truck stop coming down the road with their supplies. Everybody ought to be prepared to be self-sufficient for a period of time. There are people who don’t even have any food in the house to eat for dinner. Right, right, much less either three days, this sort of well-known bug out period, the 72 hours or much less three weeks, which, you know, very important, very important thing, and it’s so inexpensive and so easy to take some basic steps to be prepared. It’s just responsible. If you have enough for yourself, think about your neighbors. Would you like to be able to help your family and your neighbors? Absolutely, very good point. Well, Dr. Jane Orient, thank you so much for joining us today. Announcer: This show is produced by the Hartman Media Company. All rights reserved. For distribution or publication rights and media interviews, please visit www.HartmanMedia.com or email [email protected] Nothing on this show should be considered specific personal or professional advice. Please consult an appropriate tax, legal, real estate, or business professional for any individualized advice. Opinions of guests are their own and the host is acting on behalf of Platinum Properties Investor Network, Inc. exclusively.